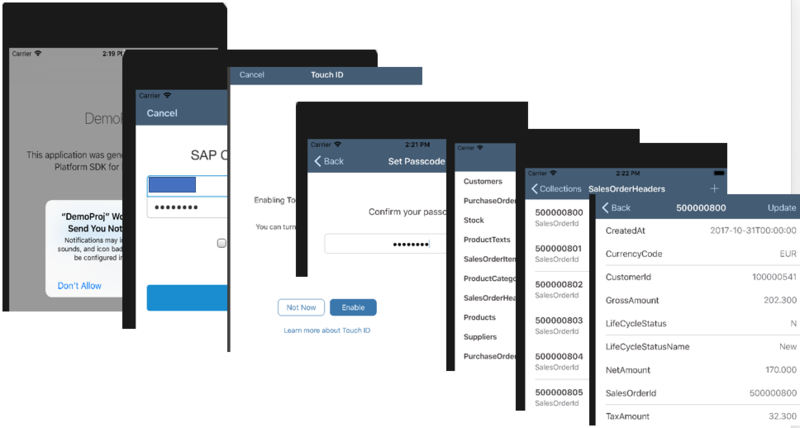 With the latest SAP Cloud Platform SDK for iOS Assistant you can create a ready to run Xcode project for iPhone/iPad within couple of minutes. that application can be accessible when you got internet connectivity in your phone either connected to wi-fi or 3G/4G or so. How to make this app offline enabled? Do i need to write any piece of code ? If yes, then where and what? How will i take care of app flow when app goes in background and want to bring it back in foreground? How will i take care of app flow if i accidentally kill app from background and relaunch it? There could be so many questions like above. To answer these, yes, you need to write some piece of code to enable app for offline usage. The latest addition of framework (SAPFioriFlows) will take care of app on-boarding and restoring process. Running the project on a simulator leads to an online master detail app , it was very easy, right? I wont be able to access app data if i dont have internet connectivity in my device since app is not yet offline enabled. 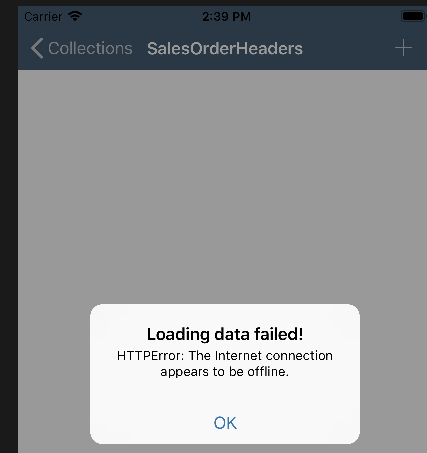 What if i want to have only “SalesOrderHeaders” collection as offline enabled? How to do that? 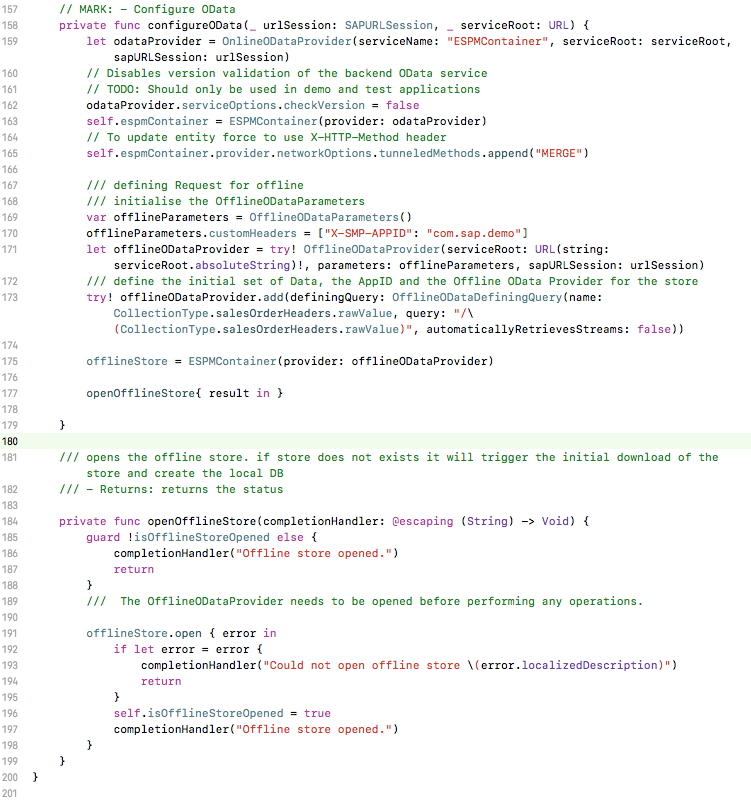 What piece of code i have to write in which swift file? For doing this, we need to understand “OfflineOData” concept. 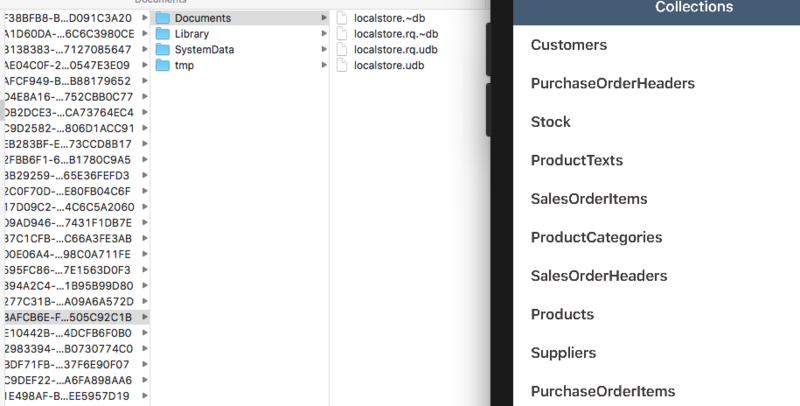 In SAP Cloud Platform SDK for iOS, we have SAPOfflineOData framework, which retrieves back-end OData services when the app is online, then creates an offline OData store which is initialised and populated with a list of defining queries. The store is persisted on the device. Device users manipulate the local data (create, update, delete. query and so on ), then later upload the offline changes to back-end via SAP Cloud Platform Mobile Services for Development & Operations. SAPOfflineOData also provides additional functionalities. In 2.0 release, the handling of the DataService has been moved into the AppDelegate’s ConfigureOData function. OfflineODataProvider: A data service provider for Offline OData. OfflineODataParameters contains the configuration details required to open an OfflineODataProvider. Custom headers to add to all HTTP communications. These are added to HTTP requests between the OfflineODataProvider and server and to HTTP requests between the server and the OData backend. The keys are header names. The values are header values. OfflineODataDefiningQuery: A defining query is an OData read request that targets the OData backend associated with the OfflineODataProvider and retrieves a subset of the OData backend data. Multiple defining queries can be defined for each OData backend. Defining queries are a subset of data from the OData backend that is sent to the client either during the initial open of the OfflineODataProvider or during a download. 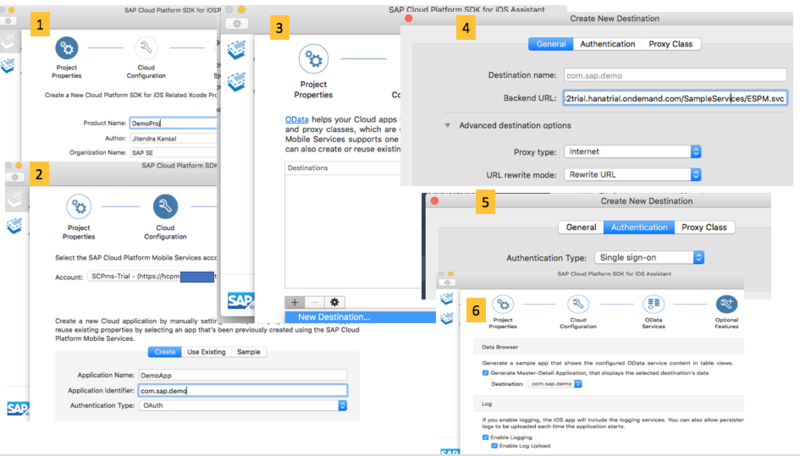 The SAPFioriFlows framework includes components that combine existing SAPFoundation, SAPCommon and SAPFiori capabilities into a higher level framework that allows you to develop complex onboarding processes using just a few lines of code. SAPFioriFlows supports most typical application onboarding scenarios. SAPFioriFlows uses SAPFoundation’s ConfigurationProvider component to gather required configuration information. Since we have generated project using Assistant, we already got on-boarding process implemented in OnboardingManager class. OAuth2AuthenticationStep: OAuth2.0 onboarding step used in restoring flow, it is responsible to configure the app’s URLSession to be able to communicate with OAuth 2.0 protected resources. ** With help of Reachability API from Apple, you can monitor the network state of an iOS device to adjust to your need. If i put my app in background and bring it in foreground or kill the app from background and relaunch, i should be able to access same data.